So yesterday I posted about Frisco, and the fact that nothing very “cancery” has been happening. Then today I realized that a “cancery” thing that has been happening is that, now that the emergency is over, I am left being much more androgynous than I was before all this cancery stuff happened. I lost all my hair, and I lost all my female organs, except for my breasts. My hormones have changed radically, with much less estrogen. My arms are getting a wee bit more wiry and buff without me doing much working out on them. My hair is growing back, but it is still in a VERY short boy-do, maybe 3/4″ or 1″. Without makeup, earrings, and a push-up bra, I could be mistaken for male. So I’m in this weird place of experiencing or experimenting with this sort of ungendered state. It is kind of interesting. I understand that it is a fad in the world of high fashion modeling that a model be gender-neutral currently. Maybe there is a future for me in that? Regarding hair, it will even take a couple more months to get my hair long enough to do even this. Very cute. And to achieve this look, it will need bleaching because it’s growing out dark ash blond/brown. It used to be blond because it was so long and had been sun bleached over the years. 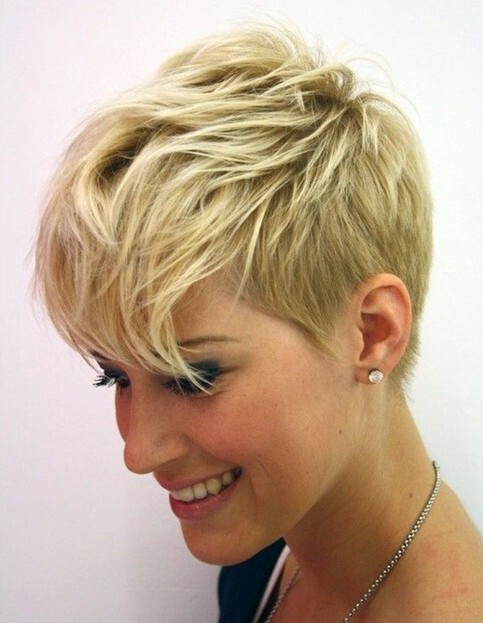 And the short pixie looks are great for people with pixie ears and nose, but that’s not me. A super cute sort of Peter Pan look. Not me. Wish it were. In any case, I see people with even semi-longish hair and think, gosh it’s going to take years to regrow. So pretty much my only option now is to learn how to deal. Maybe this will be a good opportunity to really try something entirely different. Maybe I’ll go purple, as I’ve threatened before. Still waiting for the eyebrows and eyelashes to come back in fully. Even the head hair is not full, but somewhat thin. I’m still not really “needing” to shave legs or armpits, so it is interesting how hair does or doesn’t work after chemo. Or maybe it’s not about chemo but about menopause. In any case, I am in a different phase of hair life now. “Vive la différence!” Ironic, that, as it is usually meant to say “Long live the difference between the sexes!” And here I am experiencing that very thing in my very own body. Thank you! It still may happen.